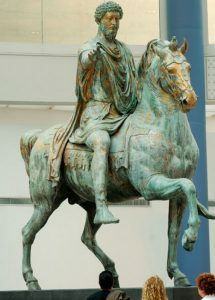 Marcus Aurelius was the last of the five good emperors. He came to the throne when Antoninus Pius died in 161 AD. Like Seneca and many other Romans, Marcus Aurelius believed in the Stoic philosophy. 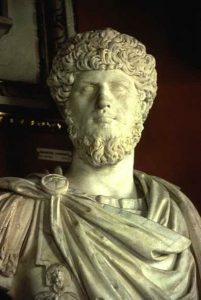 One of the first things he did as emperor was to insist on sharing power with his younger adopted brother, Lucius Verus. Lucius Verus seems to have been really not that interested in ruling, but it is always dangerous to have people around who want power and don’t have it, because they might try to get it by killing you. So Marcus Aurelius gave his brother enough power to keep him quiet. After the war, the Romans found that they had caught a serious disease from the Parthians. We aren’t sure what this plague was, but many people think it was smallpox. The Roman soldiers spread it all over the Empire as they came home, and many people died. But to the north, the Germanic people living in what is now Germany and Austria and Switzerland noticed that some of the Roman troops were gone, and there was a plague, and now THEY thought this would be a good time to attack. Marcus Aurelius spent most of the rest of his life fighting them or trying to make treaties with them. But just as he was finally winning, he died. He was 59 years old, and it was March of 180 AD. The Empire was much poorer than before, from the plague, and from having to pay so many soldiers. The Roman Empire, by Colin Wells (1984). More readable. Alternates chapters on political and social history. Unfortunately, he stops at the third century crisis. The Roman Succession Crisis of AD 96-99 and the Reign of Nerva, by John Grainger (2002). Trajan: Optimus Princeps, by Julian Bennett (2001). Memoirs of Hadrian, by Marguerite Yourcenar (1963). A famous historical novel, written through the eyes of Hadrian. Cite this page: Carr, K.E. Marcus Aurelius – last of the five good Roman emperors. Quatr.us Study Guides, September 3, 2017. Web. April 22, 2019.